Stronger together. Ending violence against women in transport. Transport is said to be one of the sectors with the worst record on violence and harassment against women workers. Women transport workers are particularly exposed to violence and harassment because they work in a male dominated sector, their work is often in public places where there is regular contact with the public, and they often work in mobile or isolated workplaces. Europe’s long economic crisis has left women transport workers even more at risk of violence while doing their jobs. According to the International Labour Organisation (ILO), workplace violence is one of the most important factors making transport jobs unattractive for women and weakening retention of those who are employed in the transport sector. In order to address the persistent lack of comparable data at European level, the ETF conducted a 3-month online survey (November 2016 – February 2017) on gender-based workplace violence in transport. More than 1400 women transport workers from all transport sectors took part in the process. The survey gives alarming evidence that violence against women is a regular occurrence in the transport sector, which often has devastating effects on women’s health and well-being and their motivation to remain in jobs in the transport sector. New risks of violence are also evident, which result from changes in work organisation, staffing shortages and job insecurities. One of the key priorities of the ETF Gender Equality work programme for 2017-2022 is to fight workplace violence against women in transport. 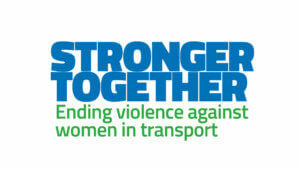 What is more, as part of its Fair Transport Campaign the ETF is campaigning to end gender-based violence in transport. The aim of the campaign Stronger together. Ending violence against women in transport. is to raise awareness of gender-based violence in transport, and help unions and employers develop better policies that address the issue at company level. Everyone must play their part in ending violence against women transport workers. That idea is central to our campaign. Working together, workers and employers, women and men, we can create a workplace culture of respect and equality. The campaign sets out to raise awareness on gender-based violence in transport, and help social partners conclude better policies addressing the issue at company level. The document provides guidance for social partners at company and sector level on how to end gender-based violence in transport. It includes ten things to do to prevent violence against women workers in transport. The document is based on best practice approaches and takes into account the specific work situations that expose women transport workers to risks of violence. The purpose of the poster is to display it in workplaces and give a clear signal against gender-based violence.